Bonn, 14 December 2015 - The team of the Technical Support Unit (TSU) to the African Initiative of AEWA is made up of personnel from the French Hunting and Wildlife Office (ONCFS), Tour du Valat and Senegal's National Parks Directorate (DPN of Senegal). 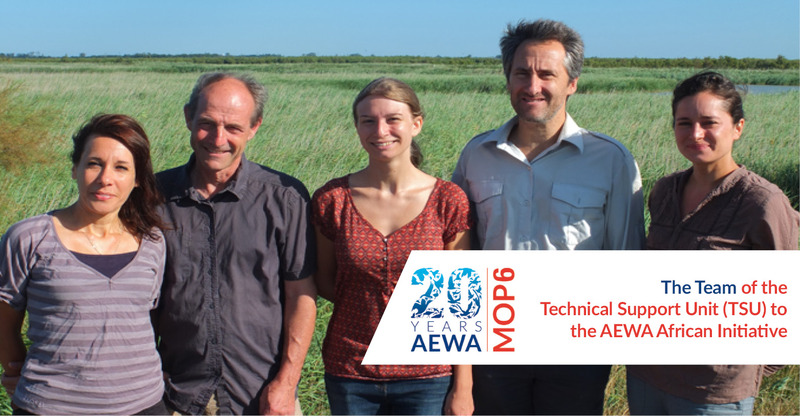 Established in 2012 at AEWA MOP5, with support from the French Ministry of Ecology (MEDDE), the TSU team has grown over the years. ONCFS's field experience in waterbird counts in Africa has been strengthened by the skills of the Tour du Valat, especially in terms of data management. A Memorandum of Understanding has also been signed with the National Parks Directorate of Senegal, which has enabled a technical coordinator to be appointed in Africa within the TSU, and enhanced activity and communication on the continent. "Like many African partners, we wish above all to increase the knowledge on the populations of waterbirds in Africa. The results of this first phase of the TSU are very encouraging, we have been fortunate to have had the chance to work with highly motivated and enthusiastic partners. We hope to return to the field soon to continue the collaboration with our African partners." This multidisciplinary team has been able to respond to several requests from African Contracting Parties, particularly in terms of capacity-building, through practical training workshops, the development of training kits on waterbirds identification and counting techniques, but also through support in the field. Jean-Yves’ favorite bird is the one painted by Georges Braque that has long been the logo of IWRB (International Waterfowl Research Bureau. It was donated to this organization by Dr Luc Hoffmann who served as IWRB’s director for a long time making a remarkable contribution to its growth. IWRB's work marked the beginning of international scientific cooperation on waterbirds and we would like to pay tribute to all those visionary pioneers of IWRB who developed the extraordinary database of International Waterbird Census (IWC) built on the field work of volunteers from all continents.